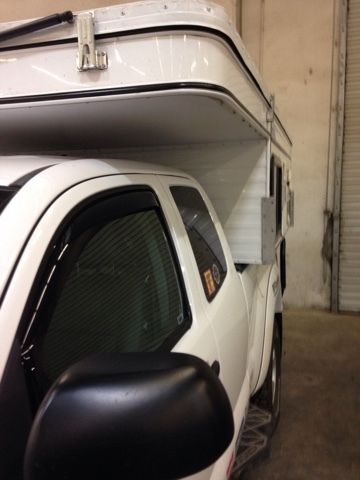 Brent's Travels: Will A Pickup Camper Be In My Future? Before my Prius conversion and before my Class B, there was the thought of buying a light-weight pickup camper for my Tacoma. I went as far as buying and installing Firestone airbags to carry the weight of a camper. 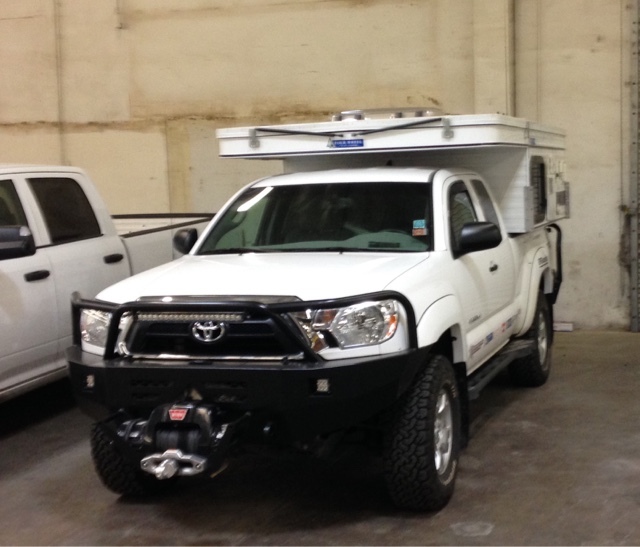 Tacoma's are a popular reliable truck and Four Wheel Campers of Woodland, CA, near Sacramento, CA, is one of the few companies that make light-weight campers for the Tacoma. 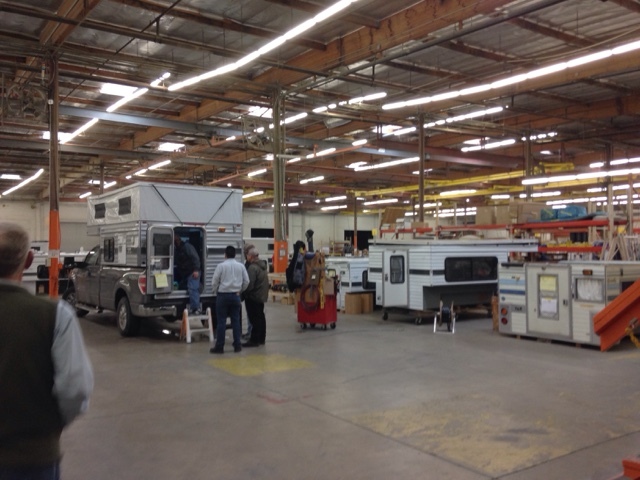 Being that I am less than 3.5 hours away here in Monterey, I decided to visit the company and learn about how their pop up campers are made and see if I still may be interested in buying one or staying with my Prius Campervan. The factory is orderly and it wasn't long before I could see they have a good team approach to the production of campers. This brochure above is where my Prius can't go. High center ridge (crown) in the road is a no go for my Prius. Although I can go many places I don't have the ability to get into some BLM or Forest Service land roads with the Prius. My Tacoma could go there and a lightweight camper would be a great camper for my needs. The question is can I really get a camper with what I need that is truly lightweight and if so at what cost. I left at 5:30 AM and with one stop, I arrived at the factory at 9:30. Shortly after signing in as a visitor I met Terry, who did an excellent job of showing me around and answering my questions. I like the wider Fleet model for the extra width. This allows me traveling by myself to sleep side to side over the cab without pulling out the bed to make it into a double. This then leaves the work area open for living. Their product seems the best for strength as their frame is all welded aluminum. They have the lowest profile driving down the road to minimize drag and lowering gas Milage. The overhang sleeping area can hold 600 lbs. 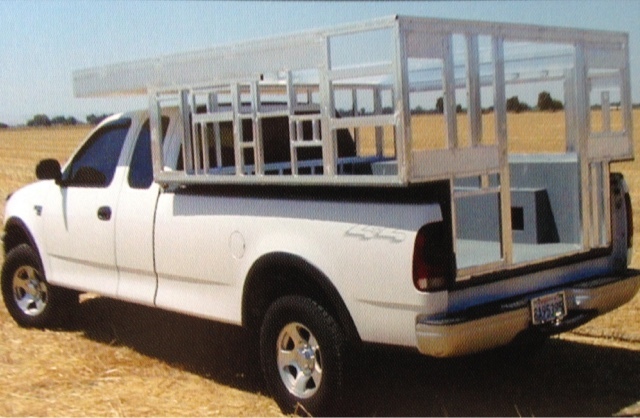 Four Wheel makes a number of models for various truck bed lengths. With the Tacoma's weight carrying capacity of 1000 and their campers fully loaded at about 1600 lbs, the back end of the Tacoma will sag without help. I mentioned I had rear airbags, like the one on the upper right on the table (see above photo). The bags do an excellent job of lifting the weight off the springs and leveling the load. 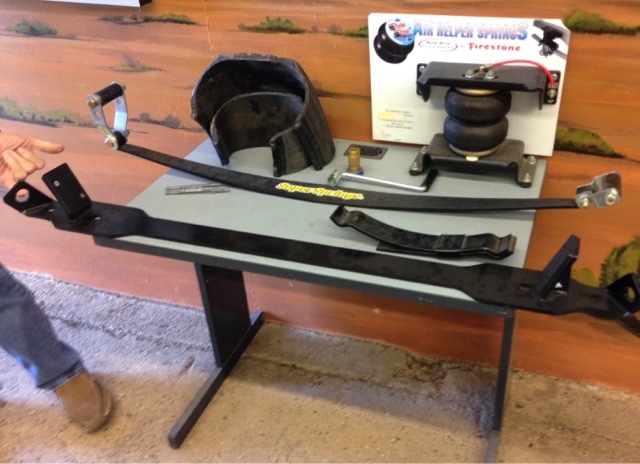 Right below the air bag in the picture is an additional leaf spring that can also be added. When I asked if I would need to add the leaf spring in addition to my air bags, Terry told me no, but added that they could be easily added later, if I thought it was necessary. My Tacoma has the towing package that gives me transmission cooling and heavy duty alternator. The lowest bracket on the table (photo above) is for composit truck beds (plastic) like the Tacoma currently has. This bracket gets bolted to the frame rails using existing bed bolts. 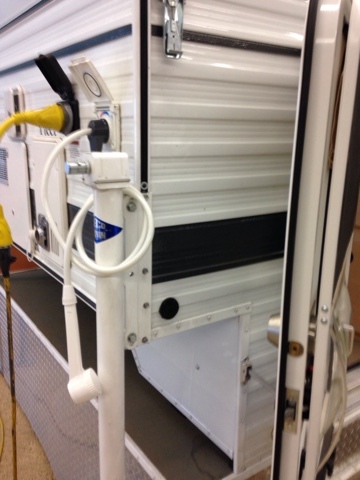 The camper gets loaded on two of these brackets that centers the camper and then the camper is tied down to these frame bars. 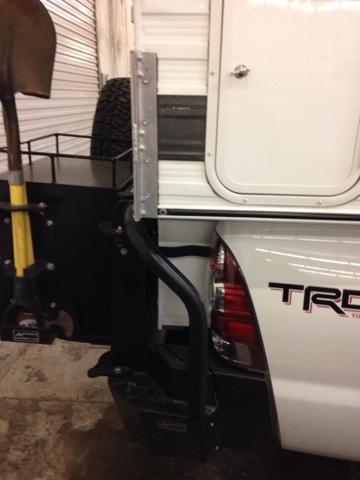 There is no external under the truck frame bars that have to be used to hold down the camper outside of the truck bed. This is a nice feature. My Tacoma is like the one above that is used for sales shows, except I have stock front and rear bumpers. Notice how low the pop up profile is above the cab keeping resistance down when driving. 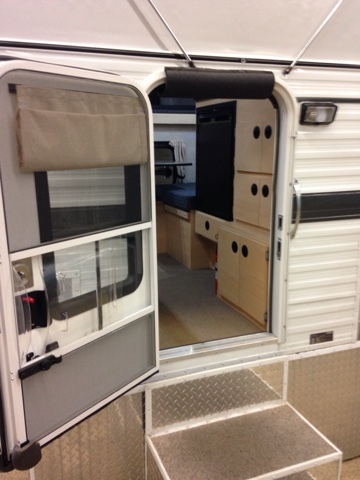 This photo is to show the camper width to the truck. 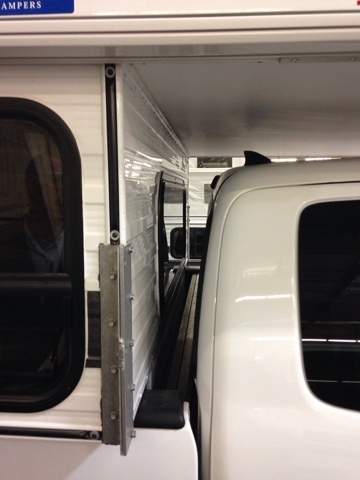 The camper sits back about an inch from the front bed mounting rail. In the back the camper sits at the edge of the stock bumper so it doesn't overhang the vehicle length. This picture from the companies literature showing the aluminum frame. Here is the aluminum frame with styrofoam in between the braces for insulation. 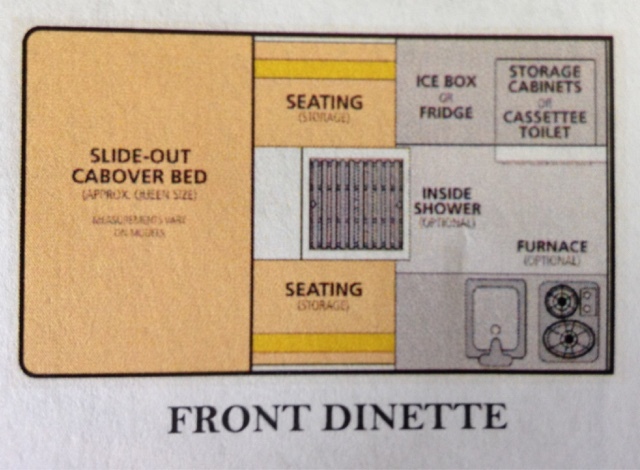 I am partial to the front dinette design. 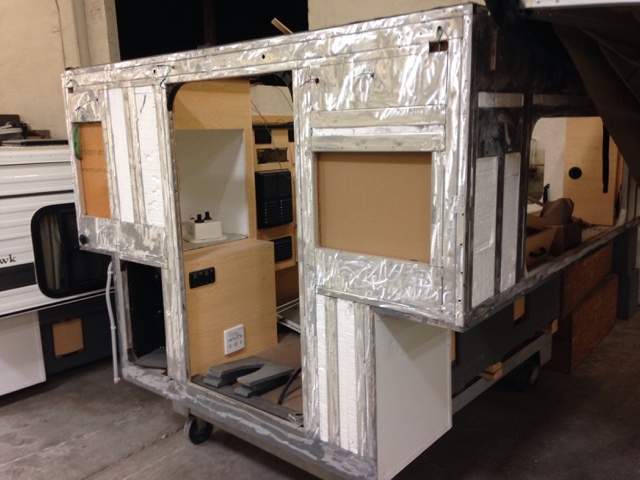 The dinette can be used as a bed even with the roof not popped up. It also gives me an excellent place to work and eat. 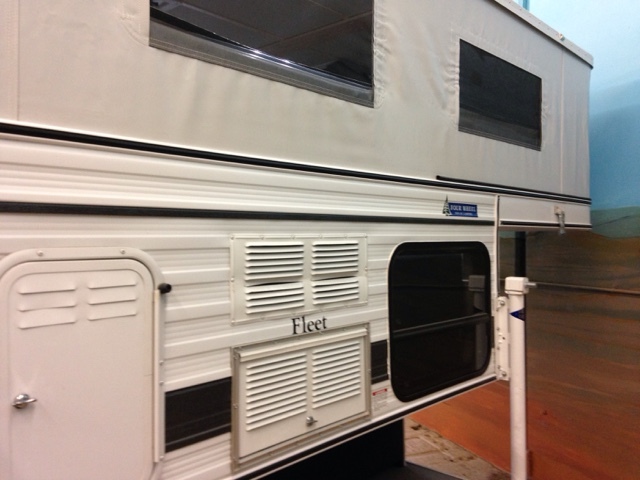 This design also gives a window on either side of the camper at the back of the dinette seats for cross ventilation. The other design is a rollover bed. You get a large side window but it is blocked by the couch. 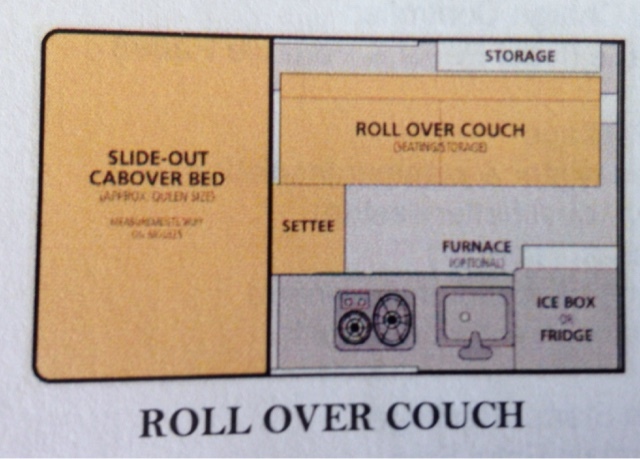 You get a nice screen door and cabinetry and storage. The black to the left of the light wood storage is a fridge when getting the dinette design. On the drivers side rear is an outside shower spray. 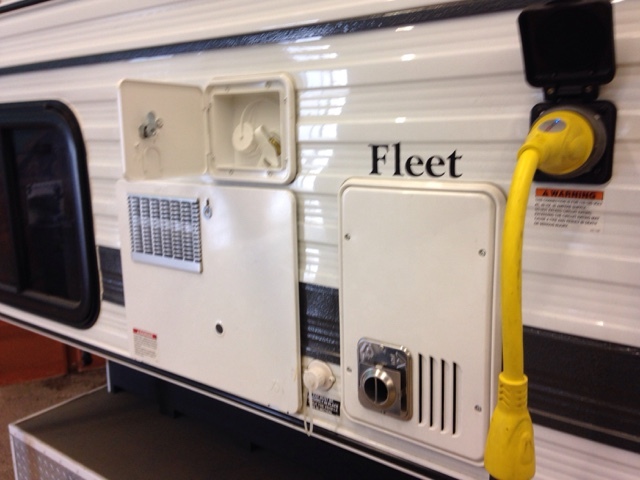 Further up on the drivers side is shore power, hot water heater, and heater. 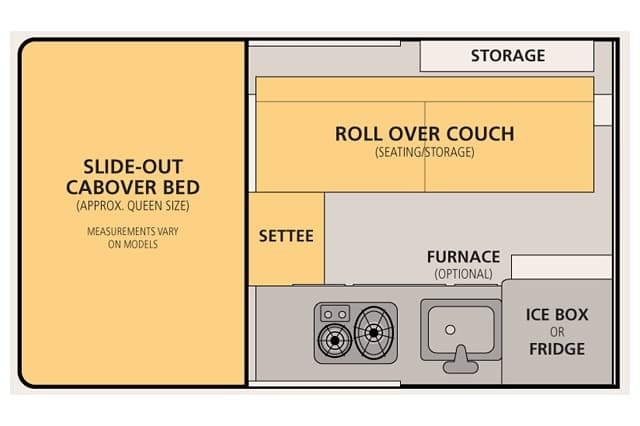 On the passenger side is the propane storage to the far rear and then the fridge vents, just behind the dinette window. It was a long drive with 3.5 hours each way and 1.5 hours for my visit. The time was worth it to get first hand information about this camper. My decision on a purchase will take some time. I will be putting the weight and options on a spreadsheet to total the weight and costs. As I told Terry I am s minimalist. I don't need everything they offer for options. For example I have a one burner stove that is fine for me. I don't need a 2 burner that is fixed as I may want to cook outside. I would rather have one stove o could use inside or outside. This goes for other options as well. I have an Engle fridge. 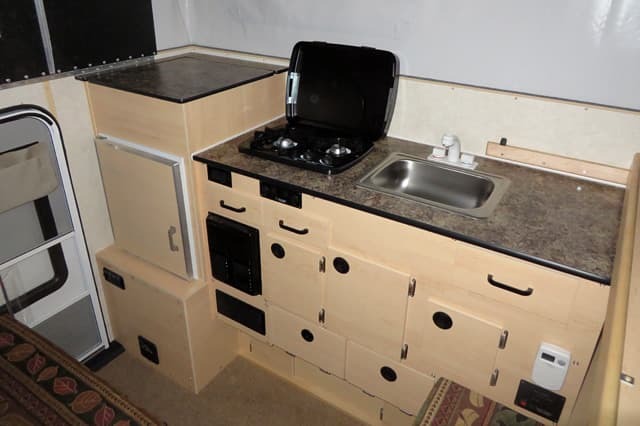 I don't want to buy a camper with a fridge when I have one. My goal is to keep weight down. Yes you can make a decision on each and say it's only a few pounds but soon it's 10 lbs and then 20 and do on. I also like designing space and building cabinets so that will be fun. Also it cost to have them build what I can do. 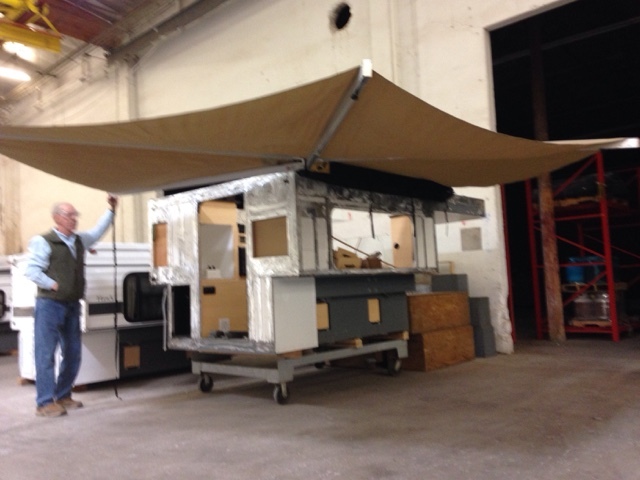 Here Terry is demonstrating a new awning called a batwing that covers both the rest and the side of the camper at the same time. This is interesting but not something I would want fm due to the weight. What I do want is solar. Here is their panel offering mounted to optional roof rack. Their panel is less than 200 watts which I have determined as a minimum for off grid power.i would want the rack mounts to mount a panel of my choice. I also would go with lithium batteries to save significant weight over lead acid. I also don't need the 20 gallons of water as 10 would be sufficient but they only offer 20 and that is 160 lbs. 10 would be 80 lbs. I have a 6 gallon tank in my Prius and I can get by 6 days as I use a gallon a day. Even this would be fine. I don't need a water heater either as I hear water as I need it. I would like a a heater but I'm not sure of this one they offer for weight. I will post more as I pull the information on cost and weight available. 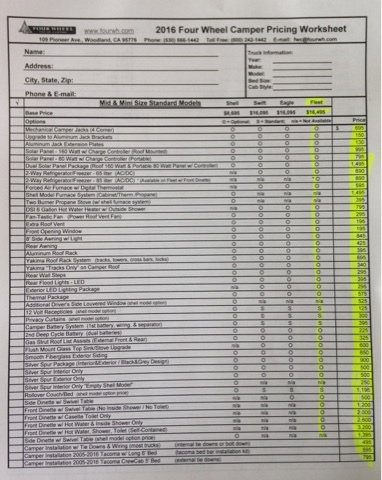 Here is the data sheet I will be working from that Terry gave me. 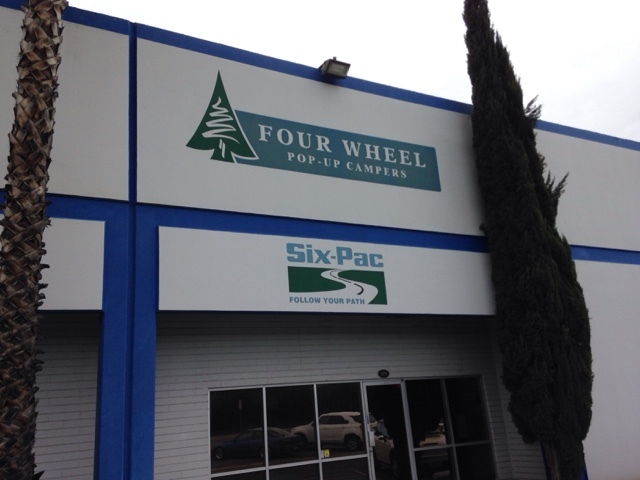 The Four Wheel Fleet is a pop-up truck camper. Truck Camper Magazine website is a good resource. I am also considering a truck camper with a Tacoma. I agree with you that weight is a major concern. Travel Lite makes a hard sided camper 690FD but it weighs 1095 dry. One of the things that was emphasized on a forum I read was not to overload the truck. You may need to buy heavier duty tires. Joseph, The sales rep thought my Towing package with airbags would be enough and I do too if I stay close to 1000 lbs on the rear based on my experiences getting construction material and gravel at 1000 lbs. I didn't mention the tires but if you look at the table with Tacoma possible upgrades there were some tire sizes on the upper left that would be their suggestion for a tire to carry heavier weight. Right now I'm leaning for the shell and designing the rest myself to control weight. I have all I need in the Prius so if I just move it that's all I would need. When I get home I need to whey what I'm carrying in my Prius as I have no clue today. Since I have the access cab on my Tacoma I would put some storage up there as well to balance the weight too. You also might want to think about resale value as well. Sure you might want to go with the minimum for what you are currently doing, but someday you may want to sell this. Are the things you are looking to pass up things that a potential future buyer might deem minimums? My guess is the in cabin stove and 20 gallon water tank may be. Remember, it may have a 20 gallon capacity, but you don't always need to fill the tank up all the way. 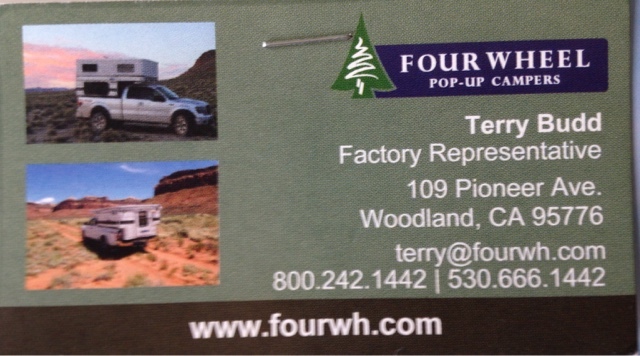 Terry the salesman, did mention resale to me when I brought up my customization. I don't claim to know more than they do but I have lived on the road for 3.5 months the last two years and almost 2 months this year. What I have learned is that you will want to cook outside as well as inside. If you can design the ability to have one stove for both you save weight. If you can do with 6 gallons vs 20 gallons of water that is a big savings on weight. Even 10 gallons is half the weight. It doesn't have wastewater storage (gray) so I would include this for the sink say 3-4 gallons. Do I need a 6 gallon hot water heater. No. I can hear water on the stove or I could look at instant gas hot water. They don't sell enough solar so that is an add. They only use lead/acid batteries that are heavy and I would use lithium at a fraction of weight. I know that there are many people out there that would want my design for weight reasons but also the extra mph you get from reducing weight. Exactly the thought that went through my mind. Although I can always find a camping spot for the low-clearance Prius I have been limited a dozen times this year going to check out sites. Of course I have pushed more limits this year. There are a could design changes I could make on the Prius to solve some interior things but the clearance is the issue. The solution of using my Tacoma my not be worth the solution when I figure the camper design all out. Life is a trade off! You are right. There were places I liked to have gone this past year with the Prius that I could not go. A Tacoma would have made it. Some disbursed camping and ome sights I couldnt get to. The SE GTG in AL was in a field and I had to move out near the road as the field was soft when it rained. Although I missed on some things with the low clearance Prius, it is my opinion that the gain of MPG and stealth outweighed the negatives. 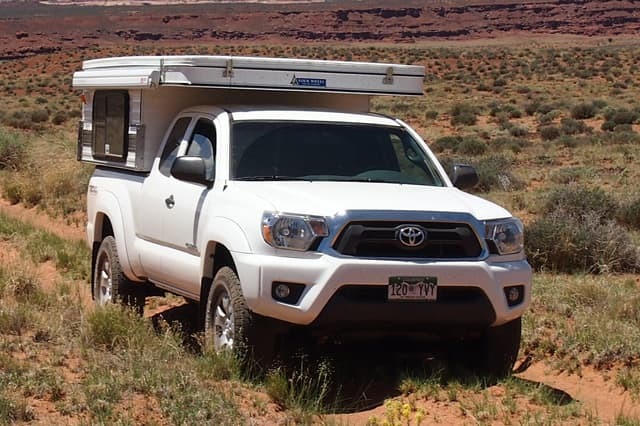 I know I would really enjoy my Tacoma with a lightweight Four-Wheel Camper but the additional cost of the camper shell of $8K+ and loss of MPG is not a good cost benefit for me unless I had a second person who was traveling with me. So now that the RAV4 hybrid has entered the market, that wouldn't tickle your fancy as the ~right~ balance of MPG and clearance? 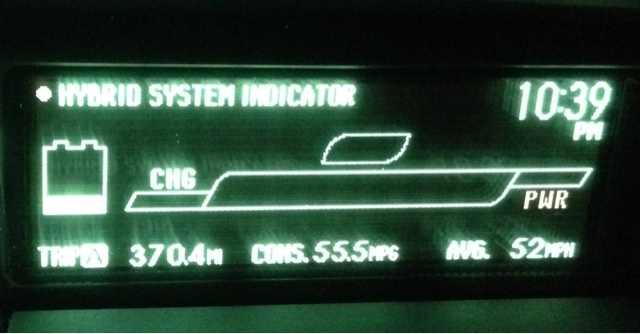 Or still stick with the Prius (man does that new Prius get awesome MPG!)? I have not evaluated the RAV4 hybrid as I haven't looked at replacing my Prius, but it deserves consideration when that time comes. When I say I haven't looked at it I haven't even looked at mpg and space for a bed in it. If a 74" bed could be done on the passenger rear and keeping the front passenger seat upright it would be a great candidate to maintain my need for stealth. The rest I'm sure I could design around. The new Prius has been whispering in my ear but not ready to trade yet. The next time I'm in the dealer for a service I will bring my measuring tape. The new Prius is a bit wider/longer as I recall. Not sure how the GC compares to your generation Prius. I bet you could get another 1/2 inch of GC by fitting slightly taller tires, would have to look into that. I looked up a comparison between gen 3 & gen 4 and Gen 4 is closer to the ground by .8 in. The Prius high voltage drive battery is behind and below the rear seat backs (inside). Your going to eventually go to actoyota dealer and take a serious look at the RAV4 for a future Prius Campervan replacement. There is no one right answer for life or how to live it. Averages don't have meaning when we are all so different. For me I had a plan for my life when I was young and I followed it. Including working at a number of jobs but all brought satisfaction. Then I retired and children have families so my plan's focus now has turned to do things that I want to do. I was lucky to have had jobs where I traveled nationally and internationally so when I retired I turned to the open road as I have always enjoyed driving and seeing / trying new things. I couldn't be doing my travels without a retirement that supports it. Although, I do need to manage expenses and that is why Prius Campervan life suits me. Argh.. Also the new model doesn't come with a spare tire. MY current car doesn't have one and I travel with compressor and plug kit, but I don't go on less than stellar roads with it. Hrmm..
Luggage space has reached an all-time Prius high—now 25 cubic feet, up from 22—thanks to the relocation of the battery to beneath the rear seat. I didn't know about no spare tire on gen 4. I knew of the added insulation and elimination of the tray. I don't like that as I like being able to control my destiny when it come to changing tires. So far the mpg is the only thing impressive for gen 4. The additional cargo space does me no good in my design. This is an informative blog, Brenton. Thanks for sharing. Having just returned from Overland Expo East I am excited about my 4 Wheel Camper future. I spoke with Tom Hanagan at OEE about the Fleet and he was helpful. There's no substitute for climbing in, poking around and asking boatloads of questions. My plans include buying a Tacoma (I'm driving a 2012 Frontier now) next year and then exploring which 4 Wheel Camper "Fleet" configuration works best. Buying a shell with a few added amenities (storage cabinets, swivel table, Batwing Awning, solar panel, roof rack for starters). The water tank, sink and stove are currently not of interest. This may change in time. I'm 62 and nearing retirement and have already driven cross country twice and stayed in hotels. Making the cross country drive in a 4W Camper and visiting campsites and National Parks would be ideal. Thanks again for sharing your experiences. Steve I really like my Tacoma and FWC is a serious consideration still in my mind as I travel in my Prius. My Prius travels have made me a minimalist and after visiting the FWC factory and reading the Wandering the West blog I believe I can take what I learned living in my Prius and use it to stay under the 1,000 lb capacity of the Tacoma. If you are interested in how I would take a Fleet Shell and build it to stay low in weight let me know. I.e. The base shell comes with 20 gal tank and I feel 6 gal is sufficient . That's an 8 lb per gallon savings. I do have Girestone Air Bags on my Tacoma that I installed myself and I do recommend them.